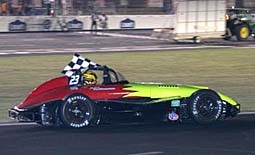 a tie for first place in the 2005 Summer Shootout Season opener. Jess and I who ran neck and neck all season. Casey Dohm brought home an impressive third place finish after overcoming all sorts of obstacles all day long. his season with a win. took the officials 30-minutes to decide who won this race. 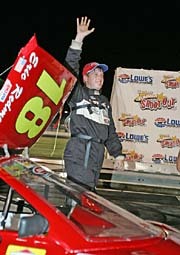 Brandon McReynolds was the car to beat in the Lucas Oil Bandolero Young Guns Feature. He took the lead on lap-four and led the rest of the way. Nobody could catch the 14-year old son of former NASCAR Nextel Cup crew chief and FOX television commentator Larry McReynolds. “I worked my way up from the back starting second to last in the heat race”, said Miktuk. “I would say a little bit of luck helped me and so did the cautions. The car was pretty good. Finishing up the top-three was Tyler Green who was not fortunate enough to miss the oil as well. And despite a damaged car he still finished third. 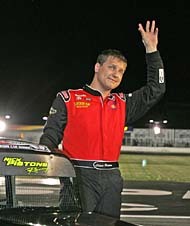 Beau Slocumb also had a strong run resulting in a third place finish. Despite his bad luck in the Legends Car Pro opener, Michael Van Wingerden had much better luck in the Duragloss Thunder Roadsters race. Van Wingerden emerged from an exciting three-lap battle on lap-four to take the lead and cruise to victory lane. Things didn’t go as planned for series veteran Ryan Zeck, but he still took the runner-up spot. For third place finisher Thomas Van Wingerden, the hardest thing for him was to lose to his brother. Michael Van Wingerden rides with checkerd flag. (Kevin Thorne Photo). Randy Thorton held off a hard charging Brain Wiemer for the win in the Verizon Wirless Legends Car Masters Division. Thorton took the lead on lap-two as held off Wiemer to collect the season opener. Weimer did all he could to pass Thorton but wasn’t disappointed with the one-two Georgia finish. Eleven-year-old Darrell Wallace Jr. was certainly on his game as he started from the pole in the 28-car field and led every lap to win the Lucas Oil Bandolero Bandits Series Opener. Rounding out the top-three was John Barilka, who battled brake problems to finish third. “I had a blast tonight”, said Barilka. “This is such a good group of guys to race with. Austin Hill took home second place after making a move on the 7-11 of Max Gresham. Gresham’s podium finish was a great way to start his season on the right foot. 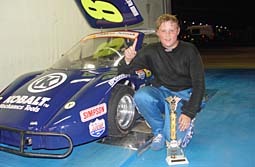 Eric Redmond emerged the winner after an exciting three-car battle that saw defending Lucas Oil Bandolero Outlaw Champion Bruce Benson, II finish second and Randy Spencer third. “The car ran great tonight”, said Redmond. “We have been working endless hours on the car and it paid off. 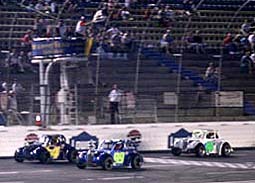 I had two lapped cars spin in front of me in turn-four coming to the checkered. I held my breath for a moment, but it all worked out in my favor.” Benson’s second place finish was not quite the run he hoped for but he Champ will take it and look ahead to next week. said Pistone. “It was a lot of fun tonight. Winning anything is nice. Second-place finisher Ben Stancill was happy to bring Team Pistone home a one-two finish. Brandon almost had the win slip away, literally when he got sideways in some oil in the closing laps. Second place driver Cole Miktuk had a strong run coming from the back of the pack to score a second place finish.